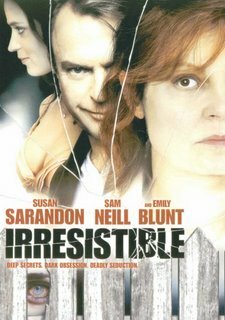 Irresistible is a poorly thought-out film. Susan Sarandon plays Sophie, who is an artist. She thinks her husband is having an affair with his secretary. When she thinks this, nobody believes her. This is basically "Fatal Attraction" again. The problem with the film is that there is no suspense at all. It shoots itself in the foot because of the predictability of the characters. The viewers will know nothing will happen to her. Sam Neill is good as usual, but he doesn't do much. In the trivia section of IMDb it says that she worked with the director for six months on the script to meet her specifications. I guess Susan supports movies with zero tension, no character development, and no sense of humor in the role. That means everybody else gets the short end of the stick. In the end: If you want a good Susan Sarandon film White Palace (1990) or Light Sleeper (1992) are better choices.